A kitchen island is a kitchen cabinet or shelving unit that is not connected to walls. This standalone unit has a countertop, like a butcher’s block, and can be mobile or fixed in place. Islands are often added to a kitchen design to increase the preparation area, storage space or to double as a breakfast bar. The look and dimensions of a kitchen island can be customised to match the style and size of the kitchen. Appliances, sinks and shelving are a few of the many additions that can fit into a kitchen island design. Check out our recent kitchen island projects for inspiration! Maximising storage space and property value with the help of a kitchen island is a worthwhile investment. Whether you want to make your kitchen more functional, stick to a tight-budget or craft a DIY kitchen island we have all the tips you’ll need. For a clear idea of what a kitchen island is have a look at this video by RunmanRecords Design. Extra prep area – The addition of a kitchen island countertop is a sure-fire way to add more space for food preparation. More cabinetry also means that you can install your favourite appliances within a kitchen island with power outlets. Customisable design – As with any most contemporary interior additions, a custom kitchen island can be modified to suit your every need. Choose a bare table-like structure or an elaborate extended kitchen island with a breakfast bar; the choice is up to you. More storage – Your kitchen storage space can easily double with kitchen island drawers and hidden pantry that can easily fit the kitchen accessories and dry goods. Alternatively, you can use the kitchen island for built-in appliances like a fridge, oven and dishwasher. Social centre – If you love socialising while cooking, a kitchen island is ideal as it can be a hub for entertaining. Incorporate a kitchen island bar, and you’ll never have to leave. Room dividing – Perfect for open-plan kitchen, dining and living areas, a kitchen island doubles as a subtle room divider that signifies the change of area function. Increased home value – Similar to a kitchen renovation, a kitchen island can instantly boost your property value. Takes up space –If the size and proportions of a kitchen island are less than ideal, it may result in clunky kitchen design. Also, if the positioning is not right, you may end up creating dead space, which is why it’s better to get professional help if you don’t know how to measure correctly. Can be costly – Custom-built and fixed kitchen islands tend to be an investment, especially if it has extras like plumbing and electric ports. However, you can stick to the type of kitchen island that suits your budget. Boxed-in – Because a kitchen island can double as a room divider, it can interrupt the flow of an open plan kitchen. Done incorrectly, an island is a hindrance and not an asset in a home. Disrupt work triangle – A traditional kitchen work triangle refers to the best layout that optimises functionality and includes the stove, sink and fridge. If your kitchen island doesn’t have a built-in fridge, sink or stove it may be blocking workflow. Safety hazard –Kitchen carts or kitchen islands on wheels can be unstable when the top weight is unevenly distributed. This instability can cause the mobile kitchen island to fall or tilt over, or in the worst case be pulled over by a child. Increased cleaning – More space means more surfaces to clean. Be prepared for a little more effort when it comes to keeping your kitchen neat and tidy. Luckily, a kitchen island with a sink can remedy the process. When it comes to the kitchen island vs kitchen peninsula debate, the main point of difference is the position. Both options offer more prep area and more storage space, but a kitchen island is freestanding, and a peninsula juts from the wall. Kitchen tables have also stood in as extra prep space; however, they are insufficient as they are not an ergonomic option, and were not made for this purpose. A kitchen island is a structured piece of cabinetry that stands apart from the rest of the kitchen and can be fixed into place or onto wheels for added mobility. A kitchen peninsula refers to a kitchen island that is attached to, or against, the wall. The section that is shaped away from the wall or kitchen cabinetry is called the peninsula or h shaped kitchen island. Can you move a kitchen island? Yes, you can have a mobile kitchen island but is it the best option for your home? Consider the pros and cons of a fixed and movable island as well as your kitchen-specifications before deciding. Choose a fixed kitchen island if you are confident you can afford the investment. A stationary kitchen island can hold an additional sink, cooktop, workbench and appliances because it’s often equipped with power outlets. A fixed kitchen island with seating is also best when you have a young family, and it limits the risk of a little one tipping the cart. Choose a movable kitchen island cart when you’re short on space and need your extra countertop to vanish at a moment’s notice. A cart is a short-term quick-fix that offers additional storage and is easy to move when needed. The open shelving of a cart offers quick access to most-used items but can be a temptation for young family members. Limit the hazard by opting for castor wheels that you can securely clamp. The kitchen island costs range from €80-8000+. The price depends on the type of kitchen island and the extras you choose. Electrical ports, size, built-in appliances are among the few additions that contribute to the cost of a kitchen island. A substitute kitchen island like a kitchen cart can cost less than €80, while the DIY kitchen island can claim €200-500 and professionally built kitchen islands require €1000+. The kitchen island is evolving, and it looks like it won’t go out of style any time soon, which is why it’s best to plan and get the ideal kitchen island design. Get a price estimateor book an appointment with the Fitzgerald team to find the perfect kitchen island for your home. The layout: Do I have enough room for a kitchen island? Where a kitchen island should be placed in a kitchen, depends on how much space you need between the island and a counter. There is an ideal kitchen layout where height, position and width all play a part. Additional kitchen island accessories, bar stools or cabinets will impact your measurements. Have a look at this video by This Old House for an idea on how to measure a kitchen island. Can a small kitchen have a kitchen island? Even the most minuscule of kitchens can fit a mini kitchen island. First consider, what you need and keep space in mind, you don’t want more storage space to make you feel boxed-in. Stick to a narrow kitchen island for a small kitchen with a counter that is slightly higher than the average kitchen island to pack in more storage. If your kitchen is too tiny opt for a kitchen cart with open storage space. Luckily, you’ll easily find kitchen island ideas for small kitchens because the web is filled with inspiration! What you want in a kitchen island and how much space you have will dictate the cost and steps of your kitchen island project. You can make a kitchen island from existing cabinets, or start from scratch. Check out this video by Wickes to give you an idea of the kitchen island DIY process. Measure your kitchen to see what size your kitchen island can be. Allow aisle clearance of at least 1m and 1.2m for drawers. Use masking tape to plot a template on the floor. Adjust as necessary. Consider using a free plan or your unique design then determine which materials and tools you’ll need for your kitchen island frame, cabinets and façade. Choose a kitchen worktop that matches the function. A kitchen island butcher block or granite is excellent for food preparation and heat resistant for a built-in stove. Assemble all the necessary tools, materials, safety gear, and place protective sheeting on the work area. Cut all the wood you’ll need before putting everything together. Start assembly with the kitchen island base. Remember to incorporate holes for power outlets, sinks and any additional built-in features you want. Get help from a plumber and electrician if you want a kitchen island with electrical ports and a functional sink. Check out our guide to sinks and taps to know what will work best. We love extras, and a kitchen island is a clever way to add helpful pieces into your kitchen. Add baskets and shelving to store vegetables, utensils or cookbooks. Wicker can create an interesting display and give the kitchen island a farmhouse look while adding convenient storage. A kitchen island is a great place for a garbage can, especially if the island is your primary work surface. Have a concealed bin in a drawer underneath to keep it out of sight and smell. You can even cut a hole through the countertop which allows for easy depositing of composting waste. Conceal essential appliances by integrating them into your kitchen island: a dishwasher, grill, oven, exhaust fan and even a washing machine can all comfortably form part of your central island! Make sure that you finalise the position of any appliances before you fit the island since retrofitting gas, water and electrical points can become quite expensive. If the area is spacious, consider enlarging the kitchen island to incorporate benches or stools to create a breakfast area. Large kitchen islands, like U-shaped or L-shaped islands, offer multiple work surfaces and create a comfortable alternative to a dining table. Give man’s best friend a space on the island to store his food and bowls. Easy to keep clean and it’s out of the way of foot traffic to prevent accidental knocking over. The design of your kitchen island can provide an invaluable opportunity to have concealed storage for your home goods. Clutter is not everyone’s friend, so it’s great to hide away books, small appliances and other paraphernalia within kitchen island end panels. House your wine collection out of the way by installing a hidden wine cellar or shelves on the side of the kitchen island. Make sure that the shelves are not near an oven. Otherwise, the wine will become undrinkable! The height of the island is perfect for an under counter microwave or bar fridge – which works great especially if you have kids! Designing kitchens with kids in mind may be tricky at first, but it is worth the extra effort. Keep your kitchen slick and utterly clutter-free with benches that tuck under and kitchen island drop leaf or extenders that slide or fold away when you don’t need them. Install hooks, rails and other useful fittings to get all the little things out of the way. A recessed panel underneath the top will ensure that everything stays within reach while remaining out of sight. Once you have your kitchen island basics sorted you can move on to the most fun part: choosing your colours, décor and lighting. 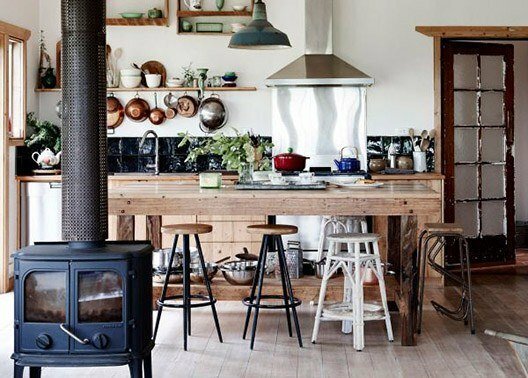 An island is a focal point in the kitchen, which is why decorating is lovely but even better when it’s at a minimum. If you need help designing a kitchen island, we’d love to help! Whether you want a shaker, hand painted or in-frame kitchen island; all is possible. Simply contact us or visit our showroomto chat with us about your dream kitchen!